Did you feel that? I think I just got bit by something. There it is again. Strange, no itch, no sting, and no pain, what is biting me? Wait, I know what that is. It is excitement! 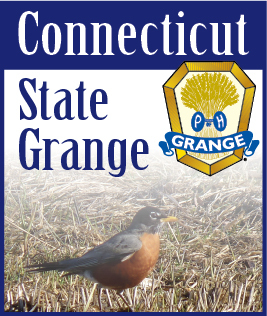 As I visit our Granges and talk to our members there is a renewed excitement all over Connecticut. We are currently in the process of re-organizing Wolcott Grange and revitalizing Simsbury. The excitement shown by these to be new members is intoxicating. These members see what we sometimes forget, OPORTUNITY and POSSIBILITY. We are only limited by our imagination. No one tells us no or we can’t, accept us. Our opportunities are boundless. All we need to do is see the possibilities those opportunities offer and go after them. I can clearly see a Grange in almost every community in Connecticut including the inner cities. I can see all Granges “spreading” the word of their activities and our membership GROWING. I can see all of our Granges doubling, if not tripling their memberships within two to three years. I can see our community service efforts receiving media attention not only within Connecticut, but nationwide. Can you see this too? I hope so, for together we can chart a course of greater service to all citizens, in every community, meeting the needs of our members, building better leaders for today and tomorrow. This is not a dream, this is reality. A true tangible reality that is obtainable in every Grange, in every community, in every state. All we have to do is want it, want it with excitement of a child waiting for Santa on Christmas Eve. I challenge every member to look at your Grange, really LOOK at your Grange and see those possibilities and turn them into opportunities that grow your Grange. When you do this you too will have that excitement we see in new members, you had it at one time so it IS in you. When you do you will feel something biting you too and it is GOOD.